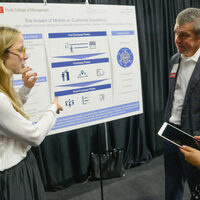 Join the Poole College of Management at our signature event — the 11th Leadership and Innovation Showcase — where undergraduate and graduate student teams will present innovative solutions to business and social challenges across a variety of disciplines, including entrepreneurship, operations and supply chain management, business analytics and marketing. Each team will have a poster explaining its project, and audience members will have a chance to discuss projects with team members. The event is open to NC State students, faculty and staff as well as the public. Advance registration is required.